With so many makes and models of heat presses, selecting one is usually confusing. To make the right purchasing decision for your business, you need to thoroughly investigate your options. Start by asking the right questions. Here’s what you should know before you sign on the dotted line. The most important question revolves around your projections for business activity. How frequently will you use the heat press? If you anticipate a steady stream of business, you will need a higher end, very dependable heat press from a reliable manufacturer to satisfy your capacity requirements. If you intend to use the heat press frequently for long periods of time, you may need an automatic press rather than a manual one. One of the critical variables in heat pressing is pressure. On a manual press pressure is regulated by turning a knob. An automatic press features pneumatic cylinders which precisely control pressure in pounds per square inch. The higher end of the product range, heat presses are generally 220 volt. These units consumer less energy but cost more. Other heat presses are 110 volt and will plug into a standard wall socket. That could be important if you will be transporting a press from one industry event to another. For most t-shirt work a medium size press in the 16” x 16” is adequate. It’s big enough to do most jobs, yet small enough to transport if you are going to fairs and industry events. The best advice when selecting a heat press is to buy the biggest that you can afford, that satisfies your specific needs. If you are shopping for an in-shop unit that you won’t move once it is in place, a 16 x 20 heat press makes the most sense. The larger platen size will allow you to conveniently align and press larger tee shirts. Here’s the downside. A press with a larger platen size will likely weigh more. It’s great to buy a model that is built like a tank. But when the heat press weighs as much as one, and you need to transport it from place to place, you may want to take weight and size into consideration. Some units can weigh more than 150 pounds. When you shop for a heat press, you may also want to inquire if the lower platen is removable and replaceable. Some swing-away units for example have removable platens, with very small platens for mugs and caps. With this feature, one press can perform the work of two. If you are going to do different types of jobs, the result is lower equipment cost. The more expensive, more versatile press will likely cost less than two presses. Different heat transfer films require different time, temperature and pressure settings. With this in mind, it’s easy to screw a job up, especially on a busy day or when layering different types of films on a garment. The more sophisticated heat presses have controllers, which can be programmed to remember the right settings for the material that you are using. Some of these intelligent controllers have as many as 70 programmable presets. If you are going to be lugging a heat press from one industry event to another (as I will be), you better make sure that it is portable. Ask the weight. Some units can weigh as much as 150 pounds and more. Generally a clamshell unit weighs less than a swing-away press. The two most popular heat press styles are the clamshell and the swing-away. On a clamshell unit the lower platen is stationary and the top platen moves up and down. On a swing-away heat press, the top platen lifts straight up and then swings to the side. While small swing-away presses are available, a common size in the 16” x 20” range. Clamshell presses are popular for several reasons. Simple in design, these presses require less floor space, weigh less and are more affordable than other designs, such as the swing-away units. If you are just starting out in the t-shirt business, a clamshell press could be a good choice for you. In selecting the model for your shop, check to see how wide the clamshell opens. Some open as wide as 90⁰, which is a good deal, because it puts more space between your knuckles and the hot top platen. 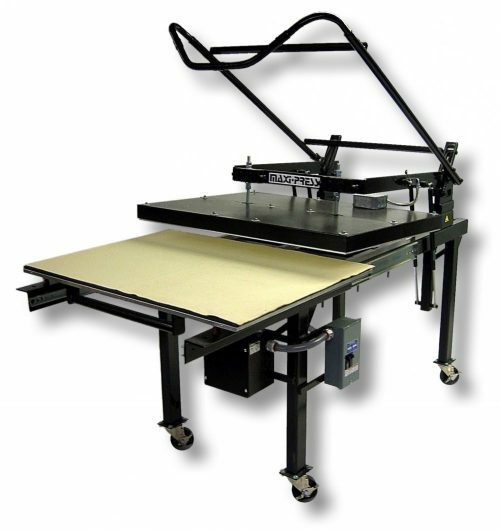 If a clamshell is such a great deal for sign shop owners, why would anyone consider a swing-away heat press? If you a working with this style of equipment, your forearms are not exposed to the heat all day long. And you are less likely to burn yourself. That’s a nice feature, but it will cost you more. You have to decide if it is worth it. If you need a portable heat press, a swing-away model is not a good choice. Even the lighter models can weigh as much as a hundred pounds. An automatic pneumatic press sounds great because the pressure settings are consistent and their performance is reliable. Remember though that pneumatic means that the press needs air pressure. That means that you will need a compressor. For most sign shops, you may want to stick with press that uses a manual pressure knob. While money is always a consideration, you should only buy a unit that best satisfies your production requirements. So buy the best unit that you can afford. Don’t forget to ask the distributor sales person what the warranty is on the heating element, the frame and the electronic controls. Also be aware that warranties will vary from one manufacturer to another and from one model to the next. In my opinion, no matter what the cost, don’t waste your money on an unknown off-shore unit no brand name recognition, no history and usually no warranty. You have great selection on the market of a number of well-known brands, which have good reputations. If you are wondering, which brands are the best, ask around. Talk to other knowledgeable shop owners, who have experience with heat presses. To select the right heat press for your shop you need to do your homework. This requires asking plenty of questions and carefully studying the manufacturers’ specification. Then compile all of the data in a spreadsheet, so you can compare the various heat press models and can make an informed buying decision. What thickness of garment will the press accept? Is the pressure adjustment manual or digital? What are the power requirements for the press? 220 volt or 110 volt? How many amps does the press draw? Does the press have a UL or CSA rating? What is the platen size of the press? Does the press accept multiple size platens? Does the press open automatically at the end of the heat cycle? Is the temperature gauge digital or analog? How much counter space does the heat press require? What does the press weigh? What does the press cost?